The Chinese name of LinkedIn turns out to be Ling Ying （领英）– the two Chinese characters mean leading and elite, respectively. The beta test of the site, lingying.com, has gone live. Its registration is currently invitation-only. Ling Ying replaced Twitter, which is blocked in mainland China, with two similar Chinese services, Sina Weibo and Tencent Weibo. Another difference is group discussion isn’t available with the Chinese version. It is speculated that one of the reasons is it doesn’t want to censor conversations or thinks it’s a cost burden. TechNode learned that Ling Ying has introduced funding from CBC Capital, who also invested in Evernote China, and Sequoia Capital. The one of the most popular business social networks around the world said earlier this month that it already had had more than 4 million users in China. Last month, Derek Shen, former VP of Renren, updated his position on LinkedIn to the President of LinkedIn China. What’s worth mentioning here is LinkedIn has been added into the latest version of WeChat that a user’s LinkedIn profile will show on his or her WeChat profile page, although it’s more obvious in the English version while it’s currently hidden among ‘unused services” in the Chinese version of WeChat. 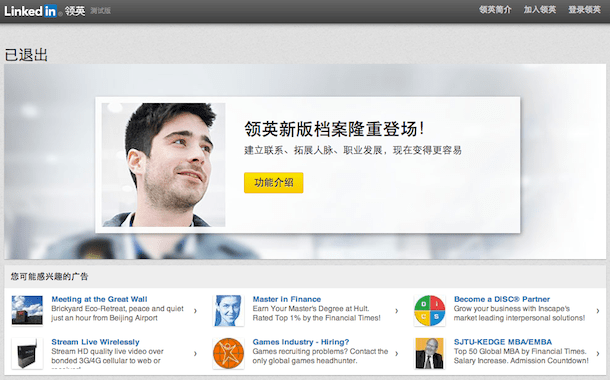 This blog post by LinkedIn China head has more information about the Chinese site.